Aquarium Drunkard: James Booker, Montreux Jazz Festival, July 1978. Looking forward to checking this out; I’ve heard of Booker but never heard his music. Doom and Gloom from the Tomb: Funkadelic – Rocky Mountain Shakedown. A farewell to the giant Bernie Worrell (DY16). Boing Boing: Legendary Betty Davis and Miles Davis funk/fusion/psych session released. The vinyl bundles are all sold out, but the single vinyl LP and CD offerings are still available. Doom and Gloom from the Tomb: Miles Davis – Paul’s Mall, Boston Massachusetts September 14, 1972. Live On The Corner era Miles. I met some work colleagues at Bukowski’s in Inman Square last night. Generally when I’ve been there in the past it’s been to go to Hell Night, which is a pretty all-consuming experience in itself. Last night I was able to soak in a little more of the ambience. Like Lilypad, a jazz club that’s only about half a block away from Bukowski’s. As I walked by last night to go to the bar, there was a pretty hot sounding quartet going (Tetraptych, if their calendar is right), but by the time we got back to the club KGB was playing. 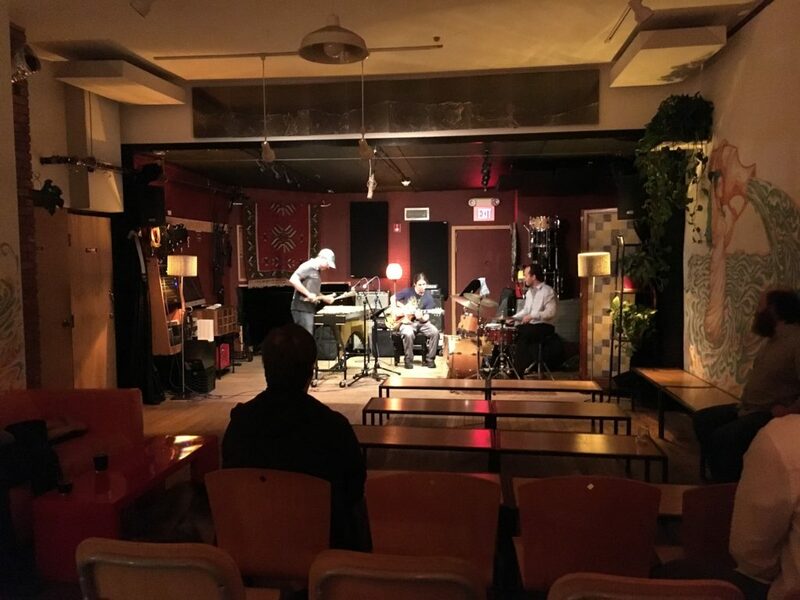 This trio (Ethan K. on guitars, Patrick Gaulin on drums, Rich Greenblatt on vibes) was sounding pretty good, playing a variety of originals, some standards (a Gershwin tune floated past at one point) and some post-bop stuff. The last tune was “Eighty-One,” the Ron Carter/Miles Davis standard that he premiered on E.S.P. Here Ethan K. played the melodic line as Greenblatt provided chordal backup, with Gaulin providing elliptical drums underneath. I loved it, but the interpretation was a little different than what I think of as the core of the song, and it got me thinking about what that means. In the original recording, by the second great Miles quintet on their first album, the essence of the song is the strong central bassline centered on the relationship between F (the tonic) and B-flat and providing rhythmic drive, while the horns play the melody complete with the leap up the octave and into a moment of silence, followed by sustained chords. The same players, with Wallace Roney filling in for Miles on the 1991 A Tribute to Miles, begins with a minute of free playing by Herbie Hancock and Wayne Shorter before going to the melody, and plays up the pause dramatically, with everyone but Carter and Tony Williams dropping out for a whole measure before the tune continues. I’ve heard some live Herbie recordings that do the same trick, with different players spotlighted in the gap, including his V.S.O.P. quintet live recordings from the 1970s. I’ve come to love this interpretation. Last night, the gap wasn’t there–each player drove ahead into the space, letting the groove take them. It was a great version, but I missed that pause. It clues you in to listen to what’s happening underneath—the groove, the drive, the breakneck craziness at drums and bass that was Carter and Tony Williams at their best.